RIDGID introduces the GEN5X Brushless 18-Volt Hammer Drill/Driver and 3-Speed Impact Driver Combo Kit. This new and improved kit features the power to tackle any jobsite task. RIDGID Brushless Motors offer up to 50% more runtime and longer motor life. With registration, this kit is backed by the Industry's Only Lifetime Service Agreement. The DEWALT DCK287D2 is ideal for almost all drilling and fastening applications around the home or jobsite. Both tools feature DEWALT brushless motors that deliver up to 57% more run time over brushed. This combo kit is backed by a DEWALT 3 year limited warranty for added peace of mind. The M18 =-inch Compact Brushless Hammer Drill/Driver is the Most Compact 18v hammer drill on the market and delivers Over 50% More Run-Time than drills with brushed motors. The Milwaukee built brushless motor, REDLINK Electronics, and REDLITHIUM batteries provide more efficient power delivery, for fewer trips to the charger.At only 7-3/8-inches long and 3.9 lbs. (with battery), this drill provides excellent control & balance in a compact size, perfect for work overhead or in tight spaces. This compact hammer drill delivers 500 in-lbs. of torque and 0-450/0-1,800 RPM, for a wide range of drilling and fastening applications. An all-metal gear case and 1/2-inch metal chuck provide maximum durability. The M18 Brushless Cordless 1/2 inch Hammer Drill/Driver delivers the most power in its class while maintaining compact size. This hammer drill delivers 725 inch/lbs. of torque and 0-550/0-1,800 RPM, for a wide range of drilling and fastening applications. The Milwaukee built brushless motor, REDLINK Electronics and REDLITHIUM batteries provides more efficient power delivery, for fewer trips to the charger. At only 7.0 inch L and 4.6 lbs. (with battery), this hammer drill provides excellent control and balance in a compact size, perfect for work overhead or in tight spaces. An all-metal gear case and 1/2 inch metal chuck provides maximum durability. 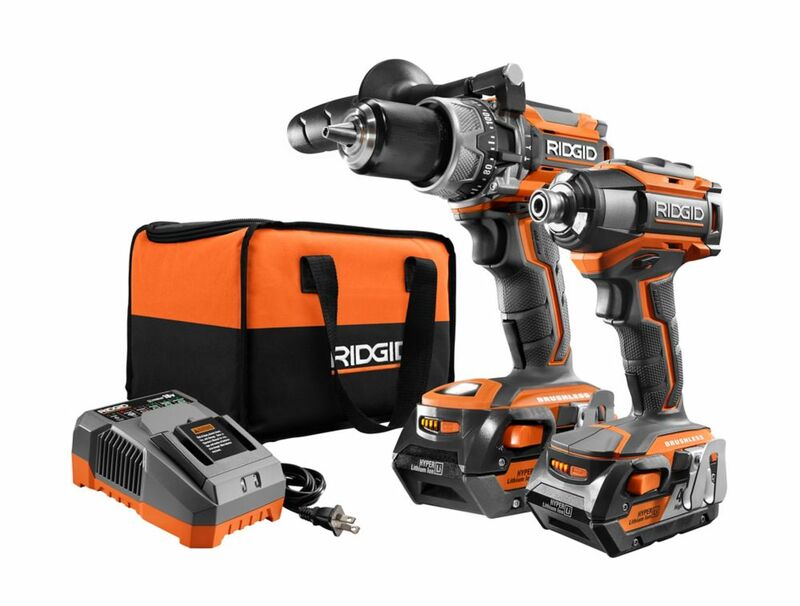 Gen5x 18V Lithium-Ion Brushless Cordless Hammer Drill and Impact Driver Kit RIDGID introduces the GEN5X Brushless 18-Volt Hammer Drill/Driver and 3-Speed Impact Driver Combo Kit. This new and improved kit features the power to tackle any jobsite task. RIDGID Brushless Motors offer up to 50% more runtime and longer motor life. With registration, this kit is backed by the Industry's Only Lifetime Service Agreement.